Phil Housley's first year as an NHL coach didn't go the way he planned. 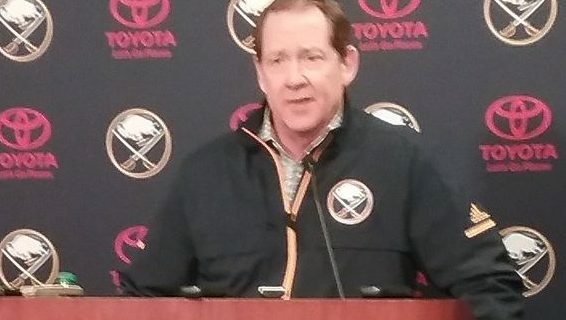 Monday’s locker clean-out day for the Buffalo Sabres at the KeyBank Center had little to do with equipment at times and more to do with therapy sessions. Yes, sticks and skates were getting packed away for the summer. But much more interesting was the way that the players were unburdening themselves about what a terrible season it was for them. You may have heard that the Sabres sunk by 20 points from the previous season to finish last overall in the NHL standings. At times, it was easy to wonder if someone was going to roll a psychologist’s couch into the middle of the locker room, and see if a member of the media asked a player why he hated his mother. The most noteworthy patient was Ryan O’Reilly, who offered an eye-opening portrait of the attitudes of himself and his team. He warmed up when he was asked how everything went so wrong. Ryan, were other players thinking the same way? “Our mindset was being OK with losing,” O’Reilly answered. “It really crept into to everyone during the course of the year. I lost myself a lot. We were kind of just trying to get through the game, being OK and not making a mistake. That’s not hockey at all. It’s crept into all of our games. It was definitely disappointing throughout the year. Kyle Okposo seconded O’Reilly’s thoughts in an equally long monologue. Jack Eichel was also willing to speak at length about the team’s problems in the session, a contrast to last season’s clean-out day when he acted as if he wanted to be anywhere but the KeyBank Center. Eichel sounded like the next captain of the team throughout his interview, including when he said the losing attitude started early in the season with a poor start. After listening to those voices, it’s not a matter of figuring out why the Sabres lost so often. It’s a matter of how they managed to get out of bed to go to the rink for games. Business executives love to throw the words “culture” and “process” around these days, perhaps because they all buy the same motivational books in airport newsstands. Even so, it’s easy to conclude that the previous approach to rebuilding the team has collapsed, and that it has left an attitude infection that will be hard to scrub away. It’s time for a new culture and a new process. Going forward, many of the most important players in the Sabres’ future weren’t even around to talk. Eight of them were assigned to Rochester on Sunday, representing reinforcements to an Americans’ team that hopes to win a championship in the American Hockey League. When players like Linus Ullmark, Alexander Nylander, Casey Nelson and Brendan Guhle see their Sabre teammates again as a group in the fall, they’ll see people like Eichel and Casey Mittelstadt – perhaps the two biggest pieces of the Sabres’ future. They all hopefully will see a few new veterans who still remember how to win and can lead the way toward better times in the future. But those young players won’t see some others who will be elsewhere next season. At least a half-dozen people will be gone from the roster by training camp, and perhaps even more. It comes with the territory, and Eichel knows it. Follow Budd Bailey on Twitter @WDX2BB.